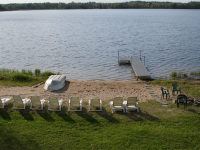 Perfect for a large family or group this cabin is a private lakehome adjacent to the resort. This cabin has 5 bedrooms and two baths. The fully equipped kitchen has a dishwasher. 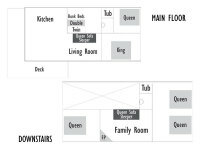 Bedroom one has a king bed, two other bedrooms each have a queen bed, one bedroom has 2 queen beds and the 5th bedroom has bunkbeds a single bed over a double bed. There are two queen sofa sleeper couches. This private lakehome has a private beach, dock and firepit. This cabin has central air. Sleeps up to 17.